As more and more designers, marketers and printers are having to work on tighter marketing budgets, the need has arisen for cost-effective alternatives to custom graphic design. Many businesses offering design services are turning to graphic design templates to meet their clients’ needs in a timely fashion and for a minimal price. StockLayouts fully editable, print-ready templates, available in seven popular layout apps, allow you to be a leader in a competitive market, providing fast, agency-quality design for print marketing. Though some designers feel templates take away from professional design, they can be a necessary resource in a cost conscious world. Rather than turn away a customer on a low budget or short time-frame, you have the opportunity to offer a solution to fulfill their needs. Custom design is time consuming and clients often don’t know what they want “until they see it.” Templates give you ready-made designs to present to your client. The client can visualize the final piece without you having to do an ounce of design work. The graphic design process will be much shorter, leaving you to pursue other endeavours. Graphic design clients will appreciate the quicker, less expensive alternative to custom graphic design. Print customers will appreciate that you can offer a complete package, from the design to the printed piece in their hand. Simply offering templates as a cost-effective alternative or as part of the complete design and print package will not significantly increase business in and of itself. Market your company to its full potential using a combination of outlets including, but not limited to, your website, SEO, print materials, social media, and word-of-mouth recommendations. Market all of your services to enhance your business. Once you’ve decided to supplement your services with templates, let your customers know you have an alternative to expensive, time-consuming custom graphic design. Leave a printed catalog of the designs you can offer on your front desk for walk-in customers. 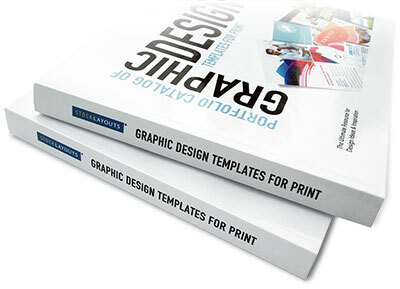 The StockLayouts Catalog of Graphic Design templates is available for purchase as a printed book or as a free eBook download. Also, full-size Preview PDFs are available for each template which you can print or email to share with your clients. Purchase a StockLayouts Template Library Subscription to get quick access to fresh creative content including thousands of layouts with photos and artwork at an affordable price.